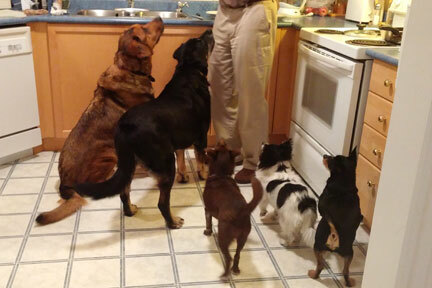 January 24, 2015 – We see lots of dogs and follow many routines for them in the course of a week. If we’re looking after them at their home while their family is away, or if they are boarding with us…those routines become even more important for us to know. Did you see the problem? We can do all the details they’ve asked for, but perhaps we don’t make our first call before 7:30 (or 7:00 or whatever you wish). Or perhaps we have three vacations to cover during March Break and this dog is logically along our route to be seen at 7:30. Some routines must be bent. How Important are Routines to Pets? From experience and from what I’ve researched – not being a behaviorist at all – I’ve learned that routines provide a structure to the animals’ lives. In a world where they ultimately have no control over their environment, a routine gives them something familiar to cling to. They find comfort in it. When routines are broken, the animals become stressed – which can lead to illness, accidents indoors, nervousness or irritability, itchy skin reactions and other things. They’re often aware of this themselves and try hard not to let you know. One dog we look after winds up to a snapping point if he doesn’t have enough exercise. He isn’t in a family situation where he has the opportunity to really run, so when we can, we bring him over and let him go crazy in our yard. When he does get pent up, he’ll give everyone a warning growl that escalates as the evening wears on and finally there’s either a fight or he hides himself beneath the bed until he calms down. Then he comes out smiling again. Another large dog we love to look after is a bundle of nerves beneath a calm exterior. He’s a worrier. We can see it in him. While he usually can take just about anything any other dog or the world throws at him, sometimes we can see when he just needs to let out his frustration. He has a collection of stuffed toys that take the brunt of this – and he nearly always has one close by. We wouldn’t dream of taking him anywhere without having one or two in the car. I’m forever sewing them things up because it doesn’t take long to shred them. But if you went over to give him a pat in the middle of the massacre, he’d roll on his back and grumble in contented bliss! What Are the Most Prominent Routines to Watch For? Mealtimes – Even if there’s just one dog or cat, he likes to know when he’ll have his dinner and where you’re going to place his bowl. Normally after a short time living (or visiting) you, they’ll come to get you about one minute prior to meal time to remind you. We could set our clock by our dogs’ internal dinner timers! If you’re feeding more than one dog or cat don’t try to be equal-minded by giving one animal his meal first one day and the other his first the next day. Follow the same pattern and put the bowls in the same place. They’ll love you for it. Walks – Some clients have developed a routine for taking their dogs out at set times, to the point where the dog won’t do his business unless he’s out on a leash somewhere. (Show dogs are the opposite. If they’re on a leash they won’t do their business because they’re trained not to while in the ring.) It’s tricky for you as a pet sitter sometimes because you can’t follow these tight deadlines and you might create a little stress as the result of it. All you can do is hit the timing as closely as possible. All our own dogs went for walks when it was convenient for us. Not them. They had a yard to play in, so that made it easier, but when we pulled out the leash, they weren’t expecting it and they were always happy (unless it was raining or windy. And since we didn’t like those days either we used to just skip them!) Everyone survived and was happy. Bed time – Again, when we visit dogs we do our best to arrive when they would normally get ready for bed, but often it is impossible. Everyone wants the same time and it becomes a very long day…and you’ll be dragging yourself out of bed to get back there for the morning call in what feels like three hours from now! If you have the dog at your place, try to place his bed or a towel in a spot similar to where he sleeps at home. Dog’s need a lot more sleep than we do…often up to 18 hours a day. But often they sleep only because they’re not otherwise stimulated. Some birds on the other hand MUST get to bed on a schedule or they will go into an off season molt. The good thing is, their awake and bedtime should match the sunrise and sunset so if they are left in a room with no lamps on, they’ll be fine. When is it Okay to Break the Routine? When you look at the reason we follow a routine, to alleviate stress on the animal by giving him structure, then it seems logical that as long as we give him structure he can count on, he’ll be able to adapt. You might get to the house at 7:45 instead of 7:00. You might not be able to do his usual one hour walk at 11:45 but you give him a half hour walk at 12:30 and you make sure he has time to do all his business without rushing and he can sniff his favorite spots and enjoy a treat when he gets back. You’re providing him with what he needs to feel comfortable and not have stress. I can think of five rescues who’ve come through a variety of life situations. You’d think they would need sound routines more than any dogs to give them security, but in every case, all they needed was a human to count on…to give them comfort so they would finally be free of stress. Every one was ready to run out to the car without a meal if it meant an adventure. Every one would pack-in a walk if the weather was nasty. They all had routines…as we all do…but they were more interested in seizing the day, now that they had the opportunity. Boredom would be more stressful. So do your best to follow your client’s routines for their pets, especially when they don’t know you well. But pay more attention to getting to know the animal himself so he can trust you to look after him and ease his mind, even while you’re there looking after his body. Today was day 24 in our 365-day series. It’s Saturday so we don’t have our regulars but the family of multi-dogs is here for the night. We’ve been booking-in boarding and vacation pet sits for the next few weeks. People are starting to think about winter holidays.